Cat art is something that can really dress up your home to fit your own unique style. Whether it is a bold and colorful print of a cat or a black and white photo, it can really showcase your love for cats! I have some affordable cat art below that you can purchase from Amazon! Snag that 2-Day free delivery for prime members and have new cat art shipped to your doorstep and get it hung and out on display! Whether you want to dress up your child’s room or add a little cat love in your living room, I got you covered! All of this art below is under $50. This is a great way to work towards revamping your living space or even office by adding your love for cats in your design. 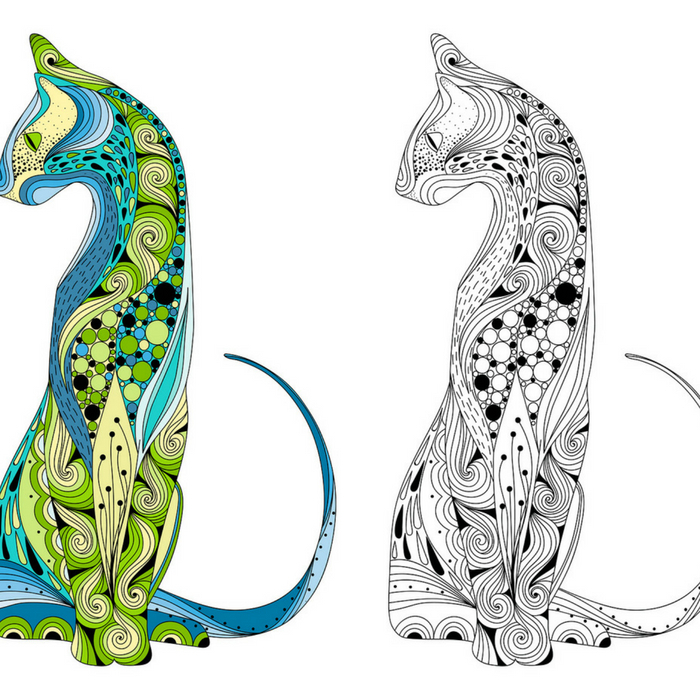 Or if you have a friend or family member who loves cats as well, these all make great gifts. If they don’t come with a frame, simply buy one or find an old one you have on hand, and slip the print inside! This Caffeine Cat art is really fun and would look cute in a kitchen nook or even office. Perfect for those days when you feel like there is not enough caffeine in your cup to get you awake and ready for the day. This 3-piece black and white wall art with a cat with green eyes really stands out. This would make a great focal point of the room whether hung above a couch, table, or just on a bare wall that needs some elements of design. Here is an abstract cat painting that is bold and fun and full of vibrant colors. 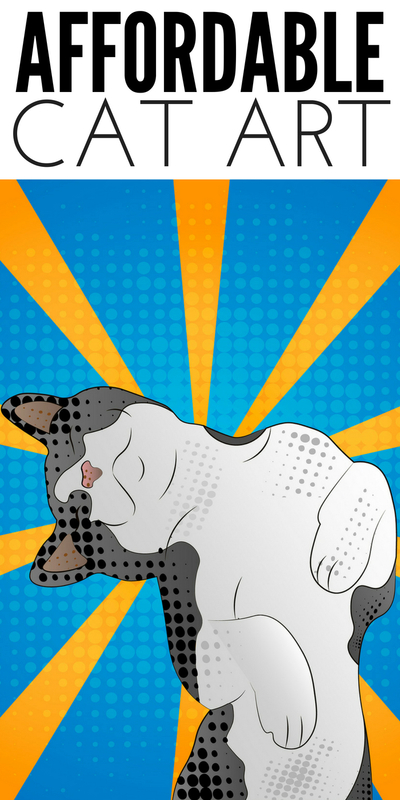 This art would be great for a young teen or child who wants some cat art in their bedroom. A fun black and white peeking kitten print would be a really classic piece to display. You could even put in a frame and sit on a display table or even your mantle. Starry Nights Cat Print is a really classic photo that is a twist on the iconic Starry Nights photo you have probably seen a time or two. This would make a really nice gift for a cat lover. Vibrant cat abstract wall art gives you that dimension in the painting like the cat is coming to life. I love this print, it is just breathtaking at all the intricate details that went into it. If you have a child or even teen who loves superheroes then you will love this Captain Cat superhero art. This would be really fun to hang in their room, playroom, or even homework nook. Check out this Pillow and Toast set of four print set. Extra playful and fun wall art to hang in your bedroom, bathroom, or even office. Younger girls will love the fun girlie colors and adorable cat prints. This Bengel Tiger Eye photo will really be the centerpiece of any room. It is a three-set print so you can put the photos close together or leave a little gap in between to showcase a close up picture of a tiger eye. This Mark Twain Cat Photo offers a fun quote with a silhouette of a black cat. I love having cute quotes and saying around my home, and this is a fun one to showcase. If you have a love for cats or know someone who does but not sure where you could display this cat art, let me help! The obvious is to hang the painting, print, or canvas on a wall. This is the easiest way to display your art, but you have to remember it also adds dimension to the room. Pair with maybe unique items like the letter of your last name, fun quotes and more to give your wall dimension. Consider putting that framed art in your kitchen. It can add a pop of color instantly or add personality. I like to take a shelf or even a corner on my countertop and put a small framed print and sit a green succulent or even a vase of flowers next to it. Halls and stairways tend to get left bare at times. Try creating a collage of items to add some color and personality to this area. Cat art will fit in perfectly! Where do you like to display your cat art you have purchased?